It’s party time at Clip ‘n Climb Dunedin! Let us give your birthday boy or girl an amazing experience! We have an awesome private party room upstairs with great viewing over the Clip ‘n Climb and LEAP area. You are welcome to bring your own food, cake, and non-alcoholic drinks (we kindly ask that you remove all rubbish after). We also have a great range of beverages, snacks and ice creams for purchase. You are able to enjoy any of our activities as part of your party package. Includes an hour of Leaping for up to 10 kids with use of the party room for 45 minutes. The discounted group rate of $14pp applies for additional kids. Includes an hour of Clip ‘n Climbing for up to 10 kids with use of the party room for 45 minutes. The discounted rate of $17pp applies for additional kids. Includes 1 hour of Leaping and 1 hour of Clip ‘n Climbing for up to 10 kids with use of the party room for 45 minutes. The special combo rate of $27pp applies for additional kids. Take out the hassle and compliment a healthy active party with a great tasting healthy party food option from Subway. Talk to us for details. If our party room is booked you are welcome to enjoy your refreshments at one of our picnic tables after your activities – these are free to use – we just can’t reserve them for you. For more information or to book a party, please contact us on 03 455 0095. How do I book the party room? Is there a minimum or maximum number for the party room? There is no minimum number to book the party room but please note the minimum charge associated with each party package. There is space for up to 20 children with additional couches and standing room for adults. How far in advance should I book my Clip ‘n Climb Party? To ensure you get a time that suits you best we advise booking 2-3 weeks in advance. To ensure the safety of all our Clip ‘n Climb guests, our friendly staff supervise all areas of the park at all times. We have strict capacity levels that we adhere to on a daily basis and all guests are briefed on do’s & don’ts before their climb time begins. Can I add extra guests? 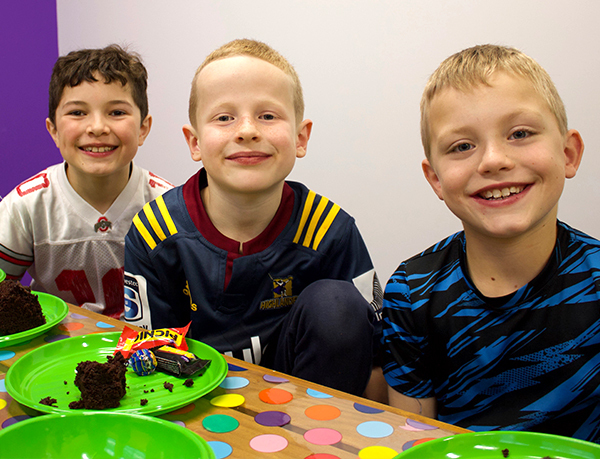 If you would like to add additional children to the event after you have booked, you can call us on 03 455 0095 or email info@clipnclimbdunedin.co.nz to see if there is space. However, please be aware that once we have passed our capacity for the session we cannot allow any extra guests. Space fills up very fast! How old must you be to have a Party at Clip ‘n Climb? Our minimum age is three years old (with a minimum weight of 10kg). If you are holding a party for three or four year olds we recommend you book your party during our special Little Climbers session where the children can use all of the Clip ‘n Climb facilities with no ‘big’ kids! What can adults do while the kids are Climbing? We have tables and other seating where parents can enjoy coffee and snacks. How Long do Clip ‘n Climb Dunedin parties go for? Clip ‘n Climb Dunedin parties run for 1hr and 45 mins. This includes 1 hour climb time and 45 mins in the private party room. We ask parents to invite children to arrive at least 20 minutes prior to the Clip ‘n Climb session to allow time for entry, harnessing, and safety briefing. Do we get exclusive use of the Clip ‘n Climb area? No, we do however ensure that our strict capacity levels are adhered to at all times. We do offer private hire of the entire facility for larger groups – enquire here. You are most welcome to decorate but please note: all decorations must be removed upon exiting the party room. What times can I book my child’s birthday party? Depending on availability, anytime during our opening hours except on Tuesdays and Fridays 10am-12pm, during school term time, as this is dedicated to our Little Climbers (three and four year olds). There is plenty of free, off-street parking available beside our building.